The black rubber bracelets were the idea of Molly Moran, a senior Justice Department official, according to people who have received them. The wristbands, like the kind people wear to support various charities or causes, started appearing on staffers’ wrists a couple weeks ago, when it became clear there was no end in sight to the standoff over the nomination of Loretta Lynch. [A] Senate floor vote on Ms. Lynch is weeks–if not months–away because of a standoff between Democrats and Republicans over an abortion provision in a human trafficking bill. The irony of the situation is that congressional Republicans spent years trying to force Mr. Holder out of his job. “Given the Senate’s scheduling and delays in considering Loretta Lynch’s nomination for a vote, it’s almost as if the Republicans in Congress have discovered a new fondness for me. 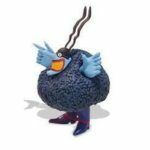 I’m feeling love there that I haven’t felt for some time,” Holder said. 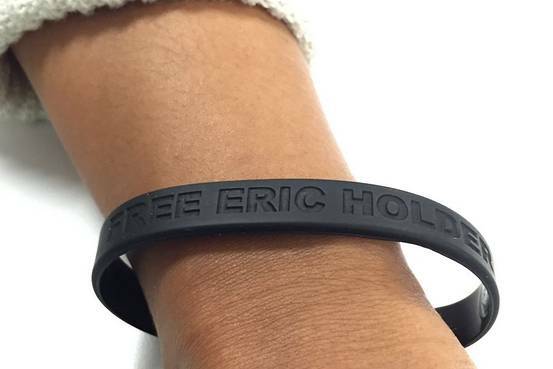 Now, the fad of little black rubber bracelets saying “Free Eric Holder” has grown beyond the Justice Department building, appearing on the wrists of some of Mr. Holder’s ex-staffers, like his former spokeswoman Adora Jenkins. She said the bracelets are a fun way to mark how the nomination process has dragged on and kept Mr. Holder in the job he’d like to leave. “I think it’s just gotten to the point where it’s ridiculous how long this has been going on and friends and supporters of the attorney general want to be able to show their support and also have a laugh,’’ said Ms. Jenkins. Staffers have paid for the bracelets with their own money – not taxpayer funds – and have talked about making Free Eric Holder T-shirts as well. “We’re hoping for a day we don’t have to wear these bracelets anymore, even if it takes a charity album,’’ joked one. What is needed is a companion wristband that says “Free Loretta Lynch,” because she is the one being held hostage by Tea-Publicans over an unrelated matter that has nothing at all to do with her qualifications to serve as Attorney General.